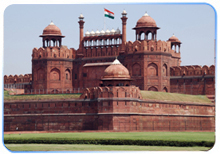 Green Chili Holidays provides you with an opportunity to experience an exclusive and refreshing Old Delhi travel experience. On our Rickshaw ride tour of Old Delhi your senses will come alive as you will come across the many enchanting sights and sounds this amazing city has to offer..
Green Chili Holidays Rickshaw ride tour will make you familiar with real roots of the place and give you a true taste of the city and make you sink in the frenzy of its colours, vivacity and irresistible charm. ChandniChowk or "Silver Square" is the most famous and historic street of Delhi, built around 300 years ago when the walled city of Shahjahanabad was established in the 17th century. Don't let the word "old" mislead you. 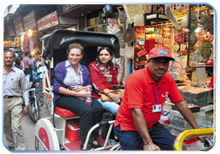 The energy of vibrant streets of ChandniChowk is simply irresistible. 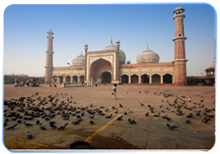 This part of Delhi includes street food, vibrant bazaars where you can shop for some ancient artifacts and jewellery.